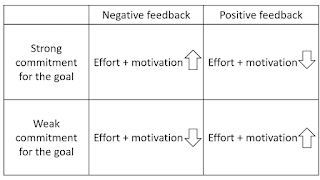 The Progress-Focused Approach: When is positive feedback more motivational and when negative feedback? 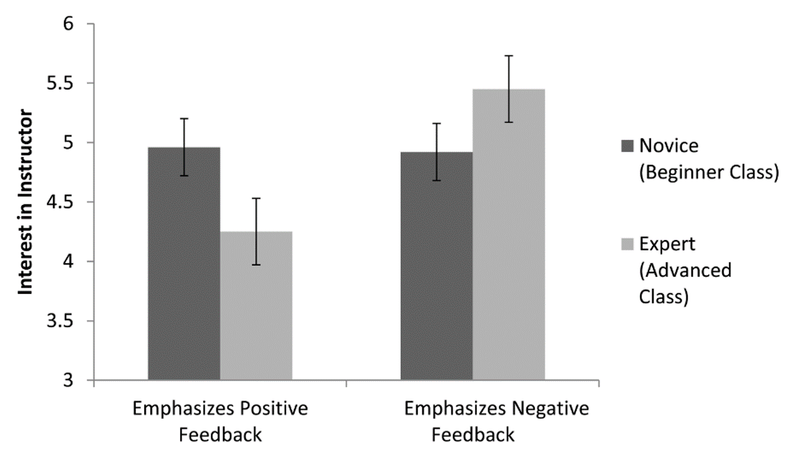 When is positive feedback more motivational and when negative feedback? Constructive feedback, both negative and positive, can play an important role in goal achievement. Previous research by Koo and Fishbach (2008) demonstrated that feedback can signal two kinds of messages. The first type of message is about commitment: it can say something about whether your goals are valuable and whether you have a good change of achieving them. Individuals which are not strongly committed to a certain goal can become more motivated after receiving positive feedback (and less after receiving negative feedback). The second message is about progress: feedback can say something about whether you have put in enough effort and whether you have achieved enough progress. 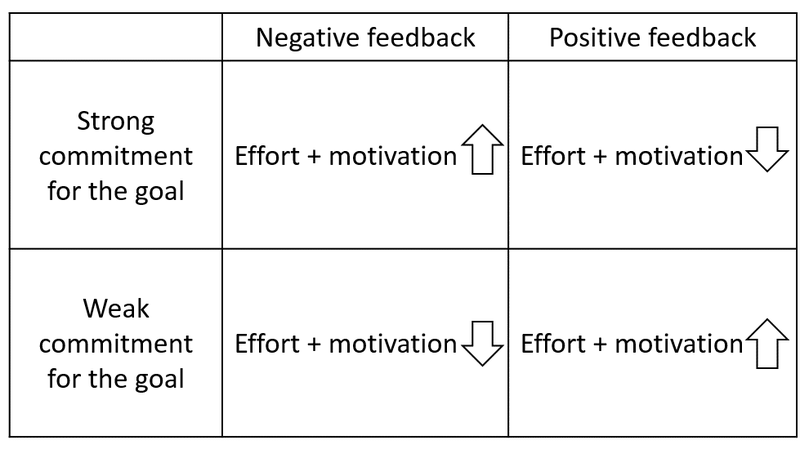 Strongly committed individuals tend to get more motivated by negative feedback and less motivated by positive feedback (see the figure on the right). By the way, with negative feedback I do not mean personal criticism or blame but constructive information about what is not going well yet and what could be better. Finkelstein & Fishbach (2011) examined the effect of expertise on what type of feedback people seek and respond to. They argued that novices who attempt to achieve certain goals are usually still uncertain in their commitment for those goals while experts are usually more stable in their commitment. That is why these authors expected that there would be a shift in the type of feedback people seek and respond to while they gain more expertise with respect to the goal. Their prediction was that novices seek more and respond more to positive feedback and experts seek more and respond more to negative feedback. Finkelstein & Fishbach's hypothesis was that individuals who view themselves as novices primarily want feedback in order to establish whether the goal is valuable and their chance of success is sufficient (the commitment function of feedback). People who view themselves as experts were expected to seek feedback mainly because they want to determine whether they make enough progress (the progress function of feedback). In 5 experiments this hypothesis was confirmed. The more people thought of themselves as experts, the more they tended to seek negative feedback and the more they were motivated by negative feedback. In two of the studies the researchers manipulated the perception of expertise. When participants were given the suggestion that they had expertise regarding a topic they were more inclined to seek negative feedback. When they were given the suggestion that they were still novices they were more inclined to seek positive feedback. In one of the other studies the researchers examined how people could be best motivated for a charitable goal (recycling). Individuals who perceived themselves as having little expertise in the topic were more easily motivated by positive messages ("the city has already done many good things")/ People who viewed themselves as having more expertise were more easily motivated by negative messages ("the city has not done a lot"). In this experiment the perception of expertise was manipulated by asking a list of easy versus hard questions about the topic). Because experts and novices are interested in different types of feedback, it is important to be sensitive to how people view their own expertise when you want to give them feedback. If people view themselves as experts (regardless of whether this is justified) they are probably more interested in constructive negative feedback. Novices, or individuals who view themselves as such, are probably more interested in and motivated by positive feedback. It is also important to realize that the perception of expertise is subjective and relative. The experiments by Finkelstein & Fishbach demonstrated that this perception can be rather easily manipulated. Answering a list of easy questions can create a perception of expertise while a list of hard questions can do the opposite. In specific situations, like in training programs, in which people wrongly view themselves as having much expertise (this is a realistic scenario considering the Dunning-Kruger effect), it may be useful to correct this perception slightly by using such an intervention. In prospect theory there is a very steep curve at the ends showing that we are extremely sensitive to small differences in likelihood of outcomes at the extremes but very insensitive to small differences in the middle of the probability curve. We're very sensitive to the rare (the expected utility of a lottery ticket grand prize is pretty low, but the big prize looms large) and the certain (we pay big bonuses for those last few percentage points to get rid of an unlikely threat). All the while the merely likely, with the same expected utility, doesn't get much attention. I'm thinking that our perception of probabilities might play into our motivation as well, and that may be affected by feedback. What do you think? "Their prediction was that novices seek more and respond more to positive feedback and experts seek more and respond more to positive feedback." Suggested correction: I think the second positive in that sentence should be negative? Hi Todd, Thanks for the correction. I have changed it. Reagarding your question: quite possible. Could you try to spell out for me how specifically you think our perception of probabilities might play into our motivation?